Everyone loves Lionel train sets and these Mega Tracks are just as amazing! It’s a new rail set where you can build your own design and do what you want! Take your train to the next level, make it your own and of course have fun playing with this Lionel Mega Tracks set! 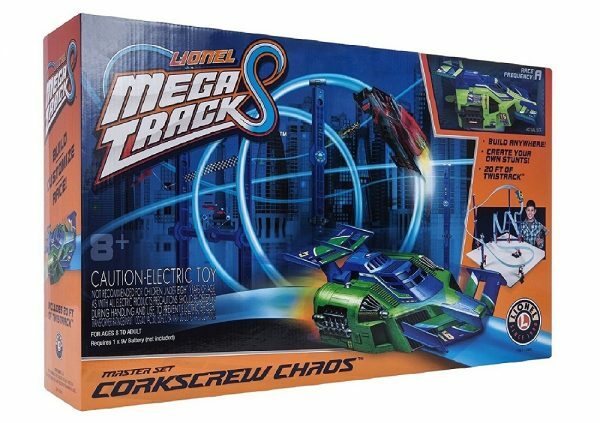 Lionel is expanding beyond model trains with the introduction of Mega Tracks, a revolutionary rail system where kids can use their imagination to design and build their own race courses! Utilizing a new clamp and construction system, kids can build anywhere, including on the floor or attaching to furniture, to create one-of-a-kind race courses. In addition to building their own track, kids can also create their own stunts by twisting the TwisTrack, a new flexible track system. Once the layout and stunts are built, kids can send the rail racer vehicle into high speed action, using a handheld RC controller to adjust the speed of the vehicle and keep it on the track.